Latest State of Giving report shows donations continue to increase. ECFA research finds steady growth in charitable givng among Christian ministries and donor-advised funds. WINCHESTER, Va., Dec. 1, 2016 – The latest numbers from the Evangelical Council for Financial Accountability (ECFA) show good news for Christian ministries. In the ECFA’s seventh annual State of Giving Report, data from 1,816 members shows that annual cash charitable giving to ECFA-accredited organizations increased 2.2 percent between 2014 and 2015. This increase corresponds with the 2.7 percent increase in giving to religious organizations that was recently reported in the Giving USA Study. The State of Giving report total cash donations of $12.5 billion in 2015, an increase from the previous year’s $12.2 billion. The report noted giving to ECFA members that offer donor-advised funds increased by 25 percent, which is similar to giving reports from secular organizations. The National Philanthropic Trust reported earlier this year that Fidelity Charitable, a donor-advised fund, pushed out United Way as the nation's top charity by funds raised. The ECFA report breaks down $16 billion of giving ($12.5 billion in cash and $3.5 billion in non-cash) to members, including churches and nonprofit organizations of various types. While ECFA’s report focuses on cash giving, non-cash giving also increased 7.5 percent in 2015 based on $3.5 billion of gifts. ECFA currently has more than 2,100 accredited members, however, some members were not included in this study because they were accredited by ECFA in the last two years, and comparable financial data for previous years is not available. The data, unadjusted for inflation, is not from surveys of the member organizations, but comes directly from financial statements prepared by independent certified public accountants—primarily audits. 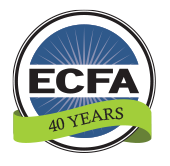 ECFA, founded in 1979, provides accreditation to leading Christian nonprofit organizations that faithfully demonstrate compliance with the ECFA standards pertaining to financial accountability, fundraising, and board governance. For more information about ECFA, including information about accreditation and a listing of ECFA-accredited members, visit ECFA.org or call 800.323.9473. The report reflected slightly stronger giving increases to larger charities compared to smaller ones.